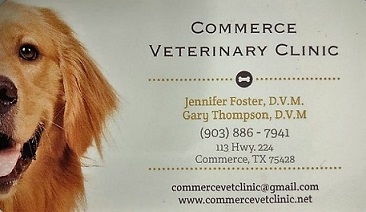 Meet the friendly staff at Commerce Veterinary Clinic! Dr. Foster is a 2014 graduate of the University of Missouri College of Veterinary Medicine. She is a Texas native, graduating valedictorian of Paris High School in 2006 and obtaining a degree in Biochemistry and Business Administration from Austin College in 2010. Her favorite part of veterinary medicine is placing all the puzzle pieces together and handing an owner back their pet all better. She has always had a passion for animals which can be seen throughout the way she practices medicine. When she is not at the office, she loves hanging out with her husband, Brent, and“herd” of critters at home as well as reading. Dr. Thompson received his Bachelor's degree in Animal Science, and his Doctorate in Veterinary Medicine from Texas A&M University in 1980. He started his career in Dallas, then moved to Hunt County in 1984, where he has lived ever since. He and his wife have two children, and four grandchildren who keep them very busy! Dr. DiFrancesco attended the University of California, Davis, where she earned her Bachelor of Science degree. She earned her Doctor of Veterinary Medicine at Tufts Cummings School of Veterinary Medicine in Massachusetts. Dr. DiFrancesco moved to the Commerce area and joined our team in February of 2018. She enjoys riding horses, hiking, and baking in her free time.